CRF is an independent high school sweep rowing (one oar per rower) program that consists of intensive physical indoor and outdoor practice. Competitive sweep rowing is a sport that cultivates hardworking athletes into successful individuals and thus, teams. Rowing achieves this through the mental and physical strength of each participating individual. Often compared to marathon running or cross-country skiing, rowing is a sport that demands cardio-vascular strength and mental focus. 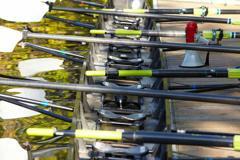 Competitive rowing demands the ultimate level of teamwork from each participating individual. 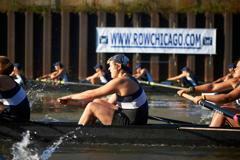 Competitive High School rowers (Juniors) can start at any grade, at any experience level. 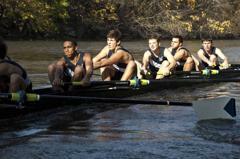 Regardless of when they start, after a year of Novice rowing, all high school rowers are considered Varsity. High School rowers, made up of all-girl or all-boy crews of 8 plus a coxswain, train 5 times a week in Winter, and 6 days during the Spring and Fall Regatta Seasons. All High School rowers compete in USRowing-sanctioned events held at local and regional regattas, while Varsity also competes nationally. 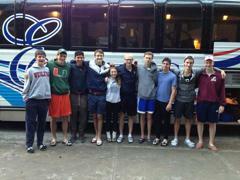 CRF is Chicago’s team. Like the city and surrounding suburban area it represents, CRF attracts a diverse team by providing any high school student, regardless of socio-economic or geographic background, the opportunity to row. We do not distinguish between private or public school, race or gender. And through our scholarship program, we offer financial support to any athlete who wants to work hard and become part of a winning team. Head Coach Mike Wallin and other members of CRF's coaching staff oversee the High School team. All of our coaches are former collegiate athletes, including national champions and former national team members. Training for the city team is held at the state-of-the-start WMS Boathouse at Clark Park utilizing the ergometers, indoor rowing tanks and in 4+ and 8+ person racing shells on the Chicago River. The CRF West team trains on the Des Plaines River, also utilizing ergometers, 4+ and 8+ person racing shells. For more great photos of CRF's high school athletes, check out this album from Head of the Rock 2016. For more great photos of CRF's high school athletes, check out these images from ROWtoberfest 2016.